Digital Image Processing in X-Ray Control of Welds. H.-D. Dau - Philips Industrial X-Ray, Germany. A. Kouznetsov - JSC Maschinbuilding Plant, Russia. This report presents the experience of creating and operating of the X-ray inspection system MU 80 F manufactured by `Philips Industrial X-Ray GmbH' for OJSC 'Mashinostroitelny zavod'. OJSC ´MSZ' is the major factory of Russia engaged in the production of nuclear fuel for NPPs and fleet reactor units. Quality and reliability - these are the main requirements during manufacturing fuel assemblies - guarantee a safe reactor operation. Manufacturer of fuel assemblies should provide for all sided tests at each production step using newest technology available on the market. Welds are important elements of fuel assembly design and they have to be 100 % inspected. One of the methods of non-destructive welds inspection at our enterprise used to be radiographic method with the registration on X-ray film. Increasing requirements to higher test productivity and operability led to the necessity of using automated X-ray imaging systems. An important factor for such systems is that radioscopy is carried out in real time. This allows, compared to standard radiography, a more convenient detection of small and difficult to locate defects. Modern X-ray imaging systems are free from all drawbacks of handling X-ray film and allow to perform a fast archiving and search for information. It was 'Philips Industrial X-Ray' that offered a possibility of creating such a system. This company has a great experience in developing and manufacturing automatic industrial X-ray inspection systems. 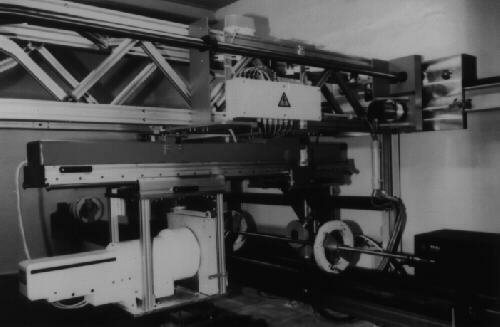 In 1992 this company developed for OJSC 'MSZ' an autonomous X-ray inspection system MU 115 F for the detection of slits in fuel rods. In 1995 they started creating the system MU 80 F which was mounted and commissioned in June 1996. The system MU 80 F is a self sufficient X-ray system for the inspection of circular and longitudinal welds of fuel assemblies. It is located centrally in the assembling workshop. Samples with a maximum length of up to 5400 mm and a diameter up to 192 mm. The maximum material thickness to be penetrated is for stainless steel 20 mm and for zirconium alloys 10 mm. Defects sizes bigger than 0.2 mm are not permitted. The inspection itself will be carried out in two rooms, an X-ray protected inspection room and an operator specific control room . The X-ray inspection room (Fig.1) incoorparates the manipulator, a high stability Philips 160 kV constant potential X-ray system with and an image intensifier system PRS 220. They are mounted on the robot-manipulator for lingitudinal movement. The manipulator moves along wall mounted rails with an adjustable speed of 2m/min. to 5 m/min. with an alignment accuracy ( 0,5 mm. The X-ray tube and image intensifier are mounted at the manipulator in such a way that the central X-ray beam penetrates horizontally the part to be inspected before being converted into a visible image by the image intensifier. The possibility of shifting along the axis of the X-ray beam both the tube and the image intensifier - in relation to the specimen is foreseen; this gives the possibility to change the inspection scheme. It is also possible to vary the beam angle for the inspection of circular welds. To increase the image quality the X-ray tube as well as the image intensifier are equipped with motor-driven lead diaphragms reducing the scatter radiation. The MU 80 F system incorporates a metal-ceramic X-ray tube with a focal spot size of 0.2 mm and max. power loading of 320 W.
During the inspection process the X-ray tube and the image intensifier jointly move along part to be tested which is located between on a roller support providing for the rotation. Due to the fact that the weight of the inspected parts may reach 100 kg the possibility to position and remove parts by means of a telpher is foreseen; in this case the manipulator is put to the limit position. The complete system control for the operation of the MU 80 F is located in the operators control room. 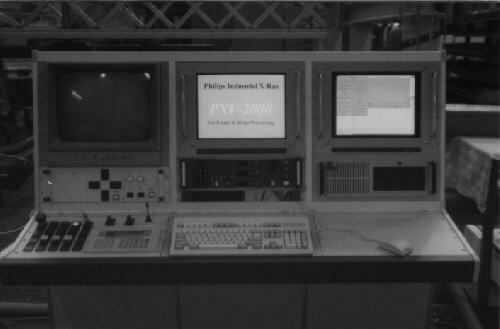 A special designed control rack (Fig.3) incooperates the manipulator control devices, the X-ray control unit, the monitors (X-ray image and operator menue) and the PC with the computer system for the image processing system PXV 2000. This PC based system meets with its technology the increasing market requirements with regard to communication with other equipment, measurement of image structures, determination of statistical data, and the archiving of fluoroscopic images. It incorporates a professional high-speed framegrabber board for digitalization and processing the analog videosignal supplied by the camera of the X-ray image intensifier. The digital 8 Bit- image ( 256 Greylevels) will be stored in a frame buffer 1K x 1K after being noise reduced by an integration depending on the noise level of the video signal. The operator positions the part to be inspected on the roller support using special jigs (Fig. 2) that can rotate by 360 and sets the mutual position of the X-ray tube and image intensifier. Due to the demands for the inspection of samples with different diameter (27mm192mm) and length (max. 6m) different jigs are foreseen. These circumstances have to be considered to ensure a sufficent detectability and accuracy of the measurement. The area of defect will be displayed and detected by the computer effected by thesystems magnification. This magnification depends on the geometrical magnification MGEO (FDD: FOD) multiplied by the electrical magnification MEL (monitorsize : I.I. inputfield). Due to the dependence of the above mentioned different magnifications the correseponding calibration (relation pixel to mm) has to be taken into account. The PXV 2000 enables the storage of several different calibrations which can be retrieved easily by selecting from a prompted menue. The further steps will be carried by the operator from the control room activating the X-ray system first. After entering the sample regarding program number the manipulator moves into its first stored inspection automatically. A laser beam is used for the indication of the X-ray beam position rsp. the defect location that provides for the possibility to perform accurate and fast repair of the weld. The "live" X-ray image will be displayed on the monitor. In case of a defect the operator starts the image processing. To increase the throughput of the inspection and to ensure an easy use of the system special automatic functions (macro) were programmed. A computer stored list of log files ensures a 100% repeatability of the inspection. These log files are stored in a data base containing all the required inspection parameter (Position of I.I./ tube, I.I.-format, kV, mA etc.) and can be activated just by entering the regarding file number. After pressing the "start" button the image of the prepared inspection position will be digitized and preprocessed (integration and filter). Then the region of interest (where the measurement is to be carried out) is selected by the operator using the mouse. The measuring program automatically starts and calculates the quantity, area and min. max. distance of defects among each other. These values are displayed on the screen, transferred and stored into an MS EXCEL file automatically. The next inspection cycle starts by entering a new log file number. In the case of additionally required documentation or archiving the processed image can be printed via a video printer or be stored on a MO medium (magneto-optical) to ensure long-term high data safety storage. The PXV2000 system also allows to create written documentation reports by using the supplied text processing program which enables the operator to insert the stored image file into the text before having it printed out on a laser printer. Due to the use of new data technology in this customer specific solution the possibilities of cost reduction as well as flexibility in the NDT field are shown. The integration of digital data transfer technology like e-mail or internet opens new possibilities for future developments. The great experience of the engeneers from 'Philips Industrial X-Ray' and the carefully specified task from the customer allowed to create a unique system for the semi-automatic X-ray inspection to measure the size and quantity of defects in weldings by substituting the X-ray film. The system MU 80 F was installed within 2 weeks and started right after mounting without any interruption of continuous production of fuel assemblies. During commissioning a joint comparative analysis of X-ray graphic and X-ray imaging methods was carried out together with specialists of OJSC 'MSZ' directly on the products; during the analysis penetrometers were used as well, and in both cases the detection sensitivity was monitored. The image processing program of the MU 80 F allows to get high quality image with required sensitivity about 1 - 2 % in case of stainless steel. The results of the comparative analysis of the welds control using both methods, proved the identity of the welds quality control. For the two years of operation there were no drawbacks discovered in this system and it functioned successfully during the mass products control providing for all the requirements to the product quality. Moreover careful study of the system allowed the factory specialists to develop the method of estimating depth of defects along the X-ray beam that was not foreseen by the general description of PXV 2000 possibilities. At the same time the operational experience of MU 80 F shows that the development of the X-ray imaging soft- and hardware digital methods of image processing and archiving reached such a level at which using such systems in industrial control becomes economically profitable when meeting high quality control requirements.